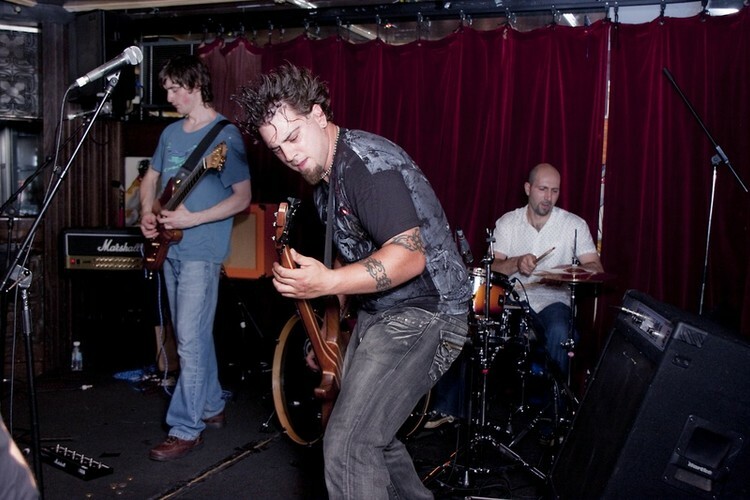 The three members of Audemia plus one more had another band in late 2009, early 2010. Ensuing dramas caused an initially-amicable eventually-nasty(ish) breakup between the three of us the one who will be known only as “the fourth.” The old name was dropped and Audemia was created, playing their first show only four weeks after their creation with almost entirely new material. The approach to music undertaken is one that is seen less and less of nowadays, in that the three of us will work on a song and let the style develop naturally, as such we are still unsure of the band’s classification, for now “Rock” should be good enough to cover all our ground, but even then you could argue against it on some fronts. We are reluctant to list “influences” because we try to remain uninfluenced. Of course we have influences, all musicians have influences; the only people who wouldn’t be in any way influenced would be Eskimos, if you gave instruments to Eskimos, they would trump us in terms of originality, because they would have no reference to work from. Whether subconsciously influenced or not, we maintain that our music is a natural creation, which is most definitely not in any way a recreation of an older artist or a Frankenstein of other artists, which sadly, seems to be the way music is created nowadays. If one of our songs sounds like another band, it was a fluke. Oh and the other band are clearly awesome. Melbourne’s most exciting three piece, The Jail Bird Jokers have been setting the local pub scene alight since 2006. Hailing from the South Eastern suburbs, The Jail Bird Jokers are a three piece Melbourne rock outfit that have busted out of their rusty cages and are ready to take the local scene by storm. They’ve shocked and dismayed crowds with their filth from venues such as The Espy and The Tote to back yards & house parties for the past five years. They’ve shared the stage with the likes of ‘British India’, ‘The Go Set’ to name a few, and have in that time turned themselves into a tight and ferocious Garage Blues Rock machine. Learning their craft through the teachings of rock gods such as Hendrix, Nirvana, Iggy Pop and the Beatles, the band creates a grooving, hard edged sound augmented by brash dreamlike pop melodies that can only be described as “Funkadelic Buzzsaw Blues”. The band comes together in QOTSA-esque guitar riffs, smooth harmonies and unbridled drumwork. Not to be outshone by their musical talent, Herrera’s vocals are intelligent, but raw. Their debut EP didn’t make it all the way to the pressing plant, but their stomping debut album ‘The Creep in Suburbia’ was released July of this year is now available online or directly through the band. If you need a taste you can find blistering tracks ‘More Than Anyone,’ ‘Crawling Out’ and ‘(I Don’t Believe In) Magic’ on their Facebook. Each song ridiculously flaunting the band’s blues, rock and garage feel like a good show pony should. With rave reviews on Triple J unearthed and an ever-growing, loyal fan base The Jail Bird Jokers are set to take their unique brand of rock and roll and make it your religion. Cheat, lie and steal to catch their next show..